Well, between the two of them, Danny and Johnny encouraged Rayado over to the fence outside the barn. 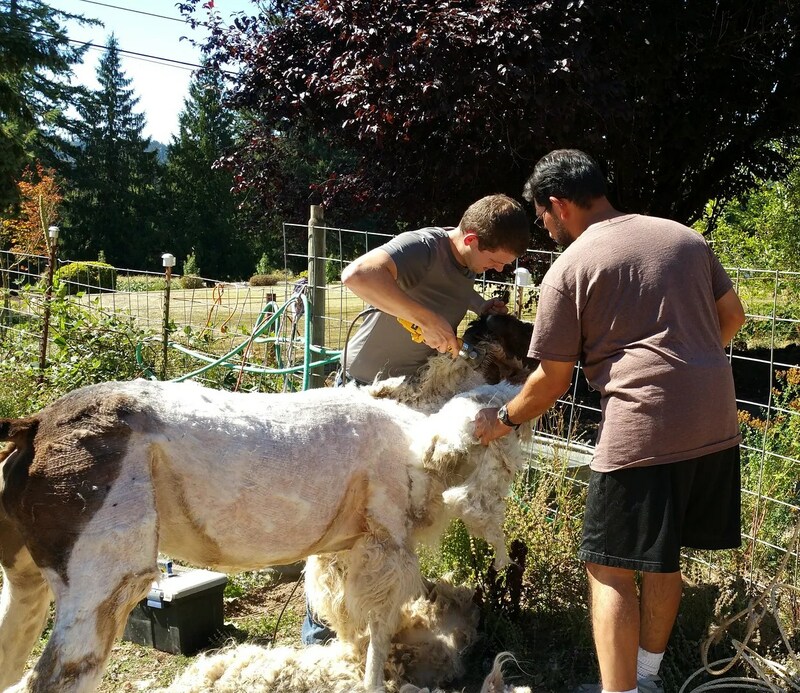 Nolemana had set things up so that the shearing could be inside, but it was hot in there, and Johnny could shear near a tree. Ricky and Miss B looked on with amusement. 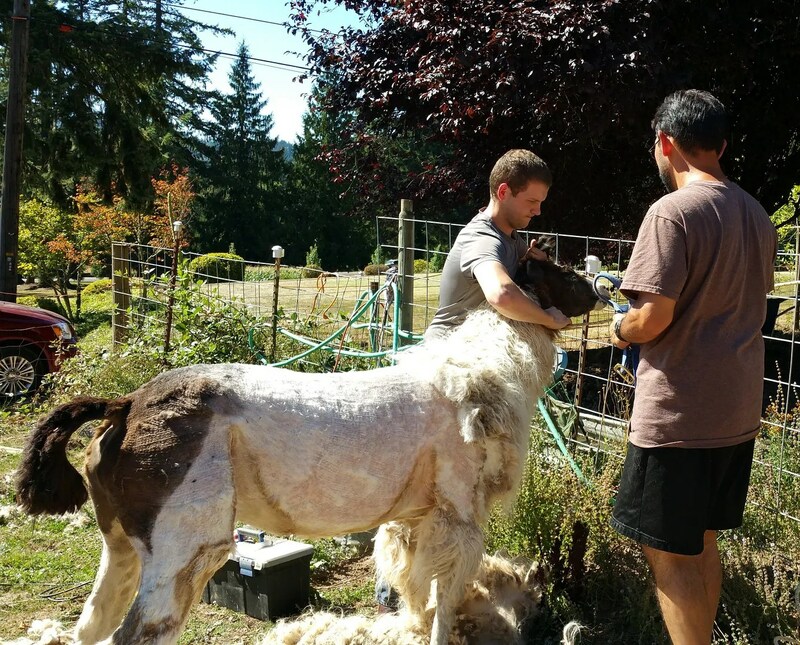 Johnny began shearing, and his instructions to Danny were, “Hug him”, and that’s exactly what Danny did. 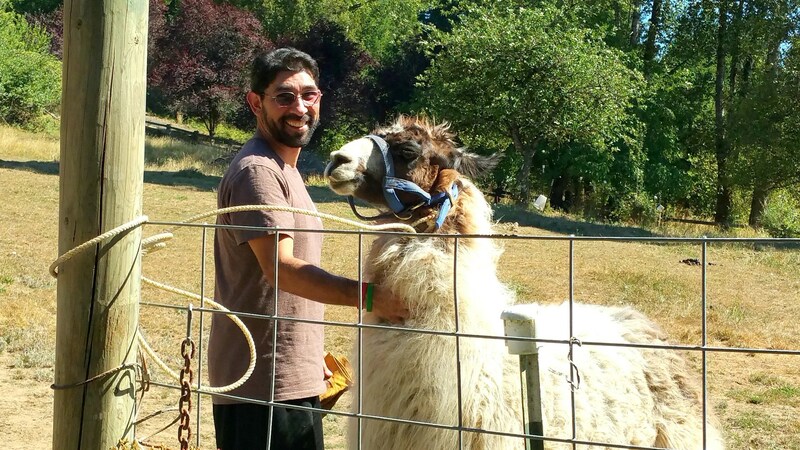 He had never hugged a llama before in his life. 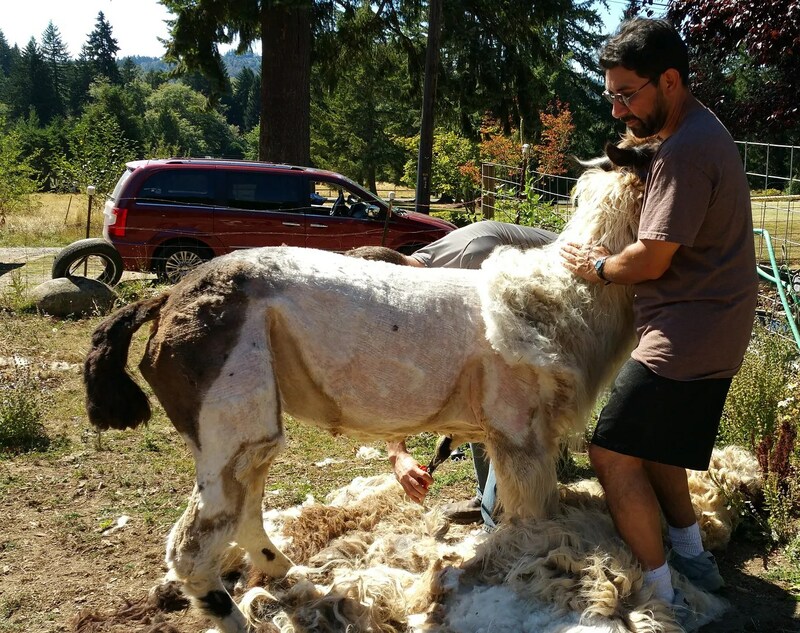 I wish I could’ve kept Rayado’s fleece; we all commented how soft it was underneath, but the outer fiber was so matted that it sadly wasn’t worth keeping. 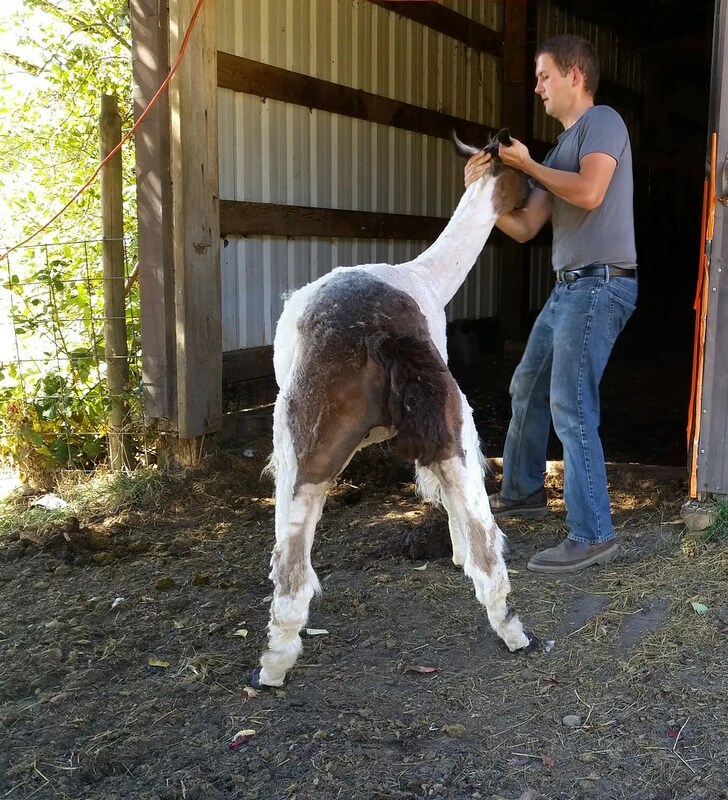 Danny was getting a wonderful education about fiber…and I was so happy to share! What really impressed me about Johnny was that he continually talked to Rayado, saying things like, “Relax, it’s okay”, and “I know, I know, you don’t like this”. He did everything he could to keep Rayado as calm as possible. I’m sure Rayado was delighted to get all that hot wool off him! 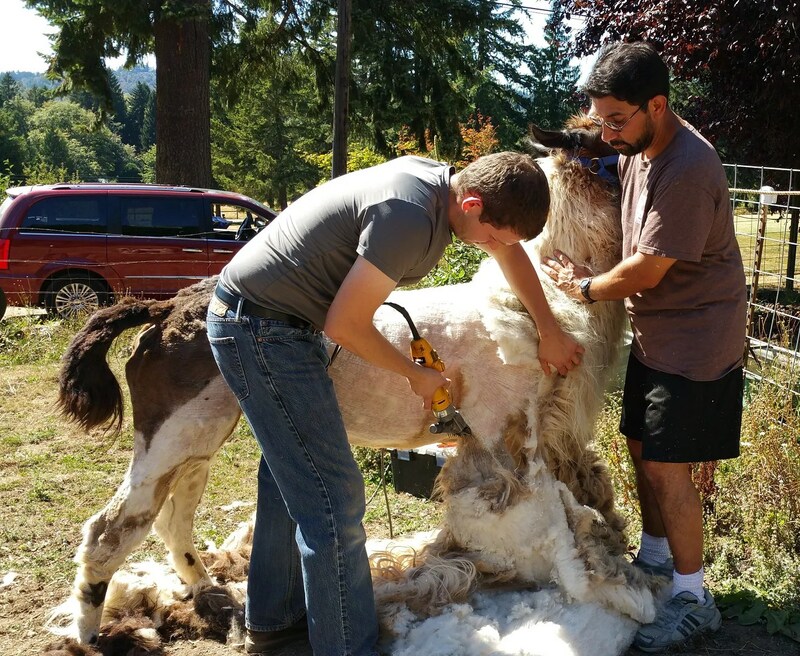 Danny loved feeling the difference before and after shearing while Johnny trimmed Rayado’s tail. 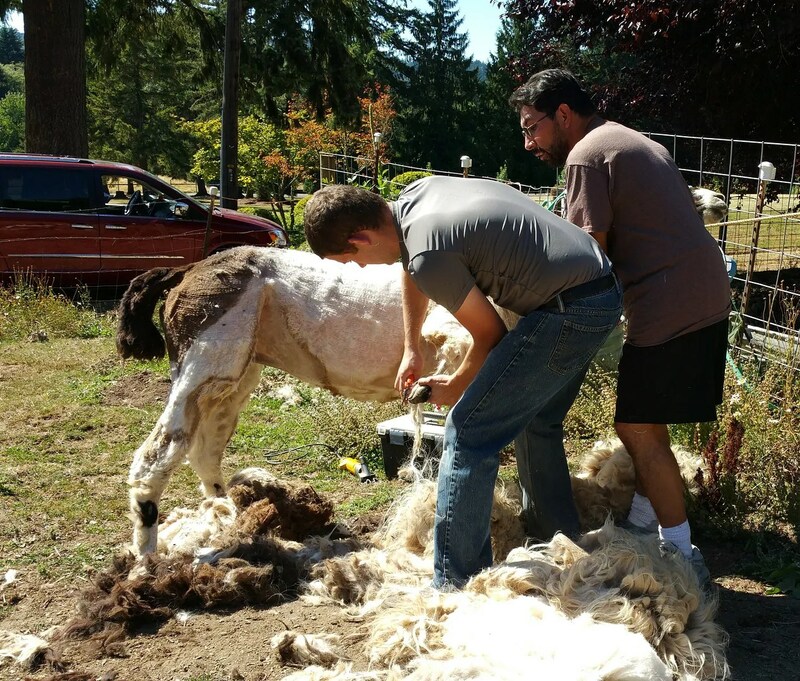 Johnny kept shearing and soothing, and Danny kept hugging. What a team! Almost pau. Seeing that fleece now, I kinda wish I’d kept some of it. Try look how kewt Rayado’s tail! 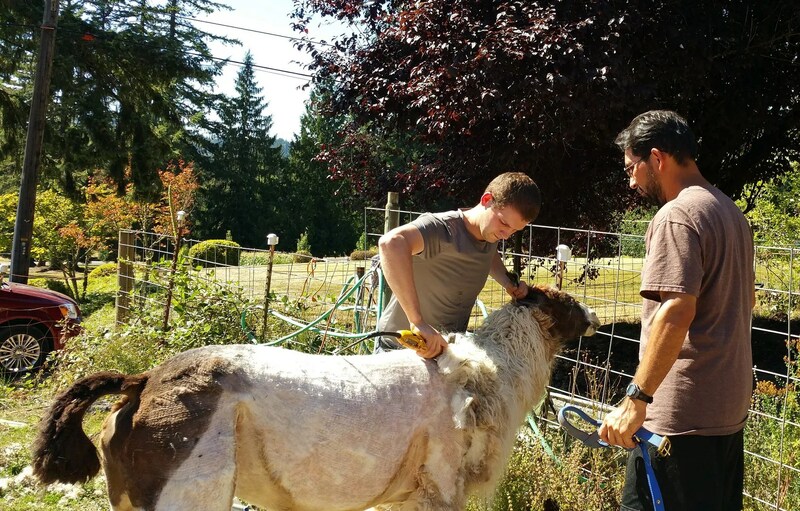 Johnny is now trimming his hooves. No, not his, you lolos. Rayado’s! 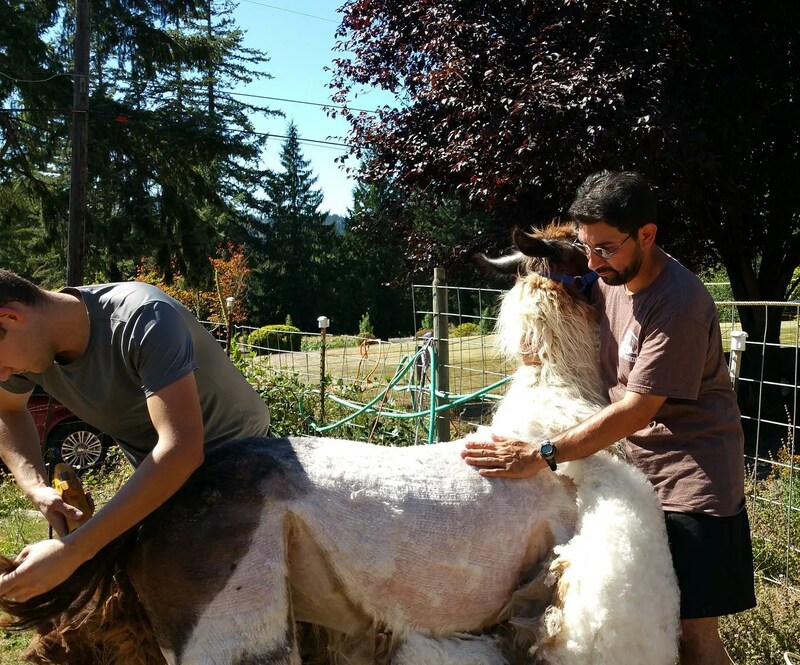 Danny was learning that a llama’s feet get trimmed differently than a sheep’s. 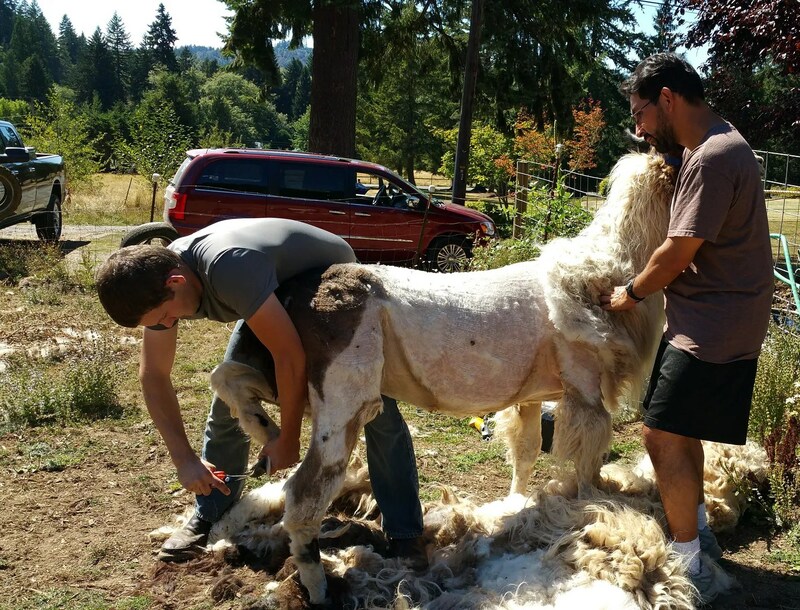 Johnny only trims the point of the hoof. This photo shows better how it’s done. 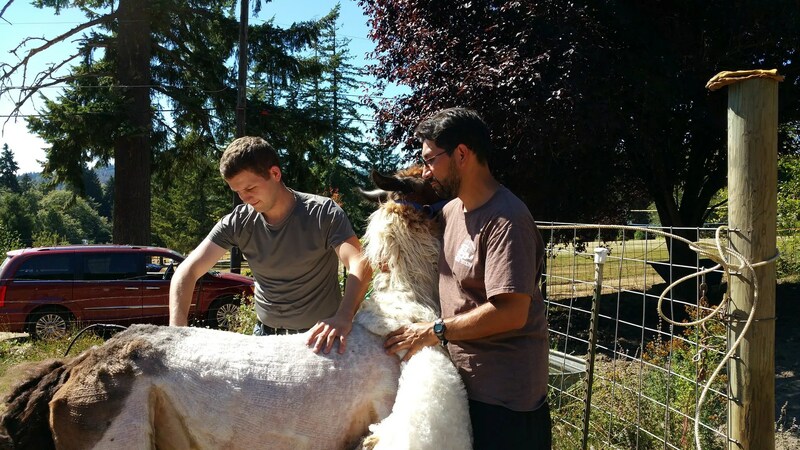 Now it’s time to shear Rayado’s neck, which he didn’t really want to have done. Johnny showed Danny a neat trick; he gently held his ears together (Ack! Indefinite pronoun alert!! Rayado’s ears together (it’s a submission thing…I guess I’d be submissive if someone were to hold my ears together lidat…but wait…mine aren’t that long so nemmine). Rayado didn’t look too happy, though. And there was no way to tell him how much more comfortable he’d be with the haircut. Danny was getting a wonderful education, and I was marvelling at how gentle and careful Johnny was with Rayado. 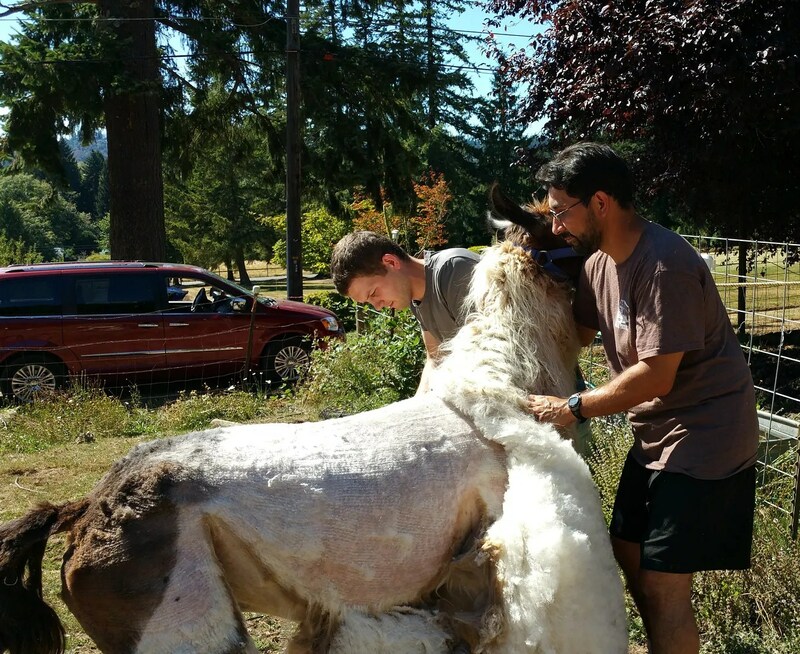 Rayado will look pretty bare after all this, but he’ll feel so much better! 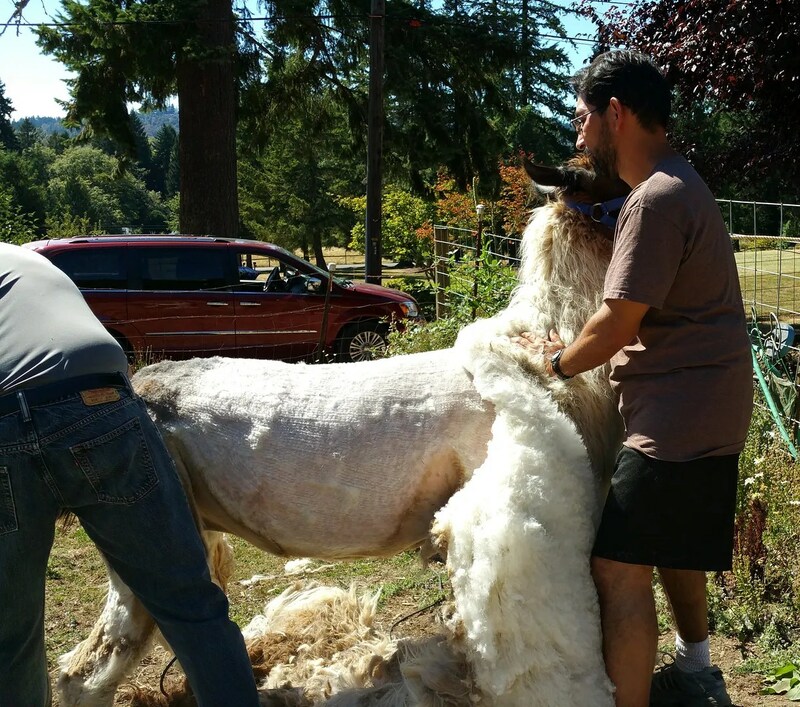 And after his neck gets sheared, he’ll get a de-worming shot. Now ordinarily, we’d just let Rayado go, but this time he has to go into the barn so that our vet could check his infected eye in a few days. 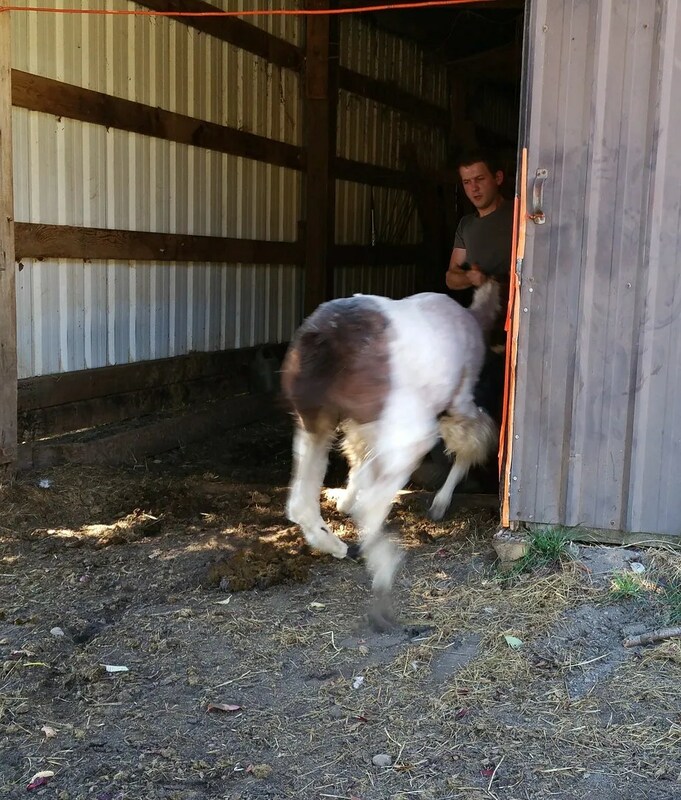 See how easily Johnny encourages him to go into the barn? No rope or anything. 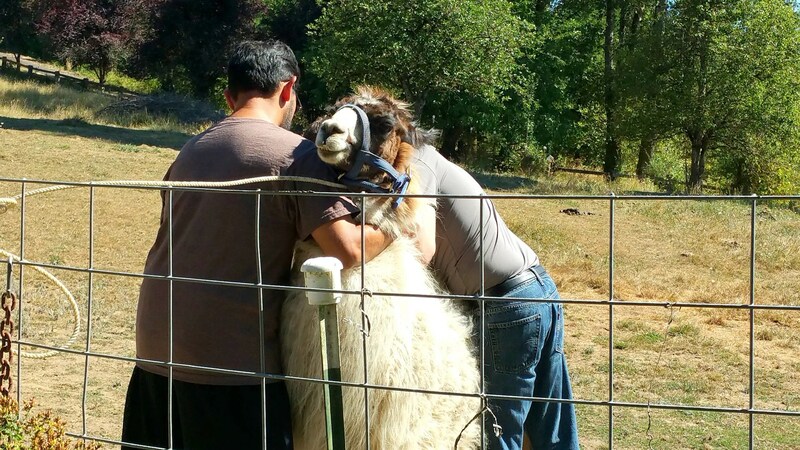 Just the llama hug. 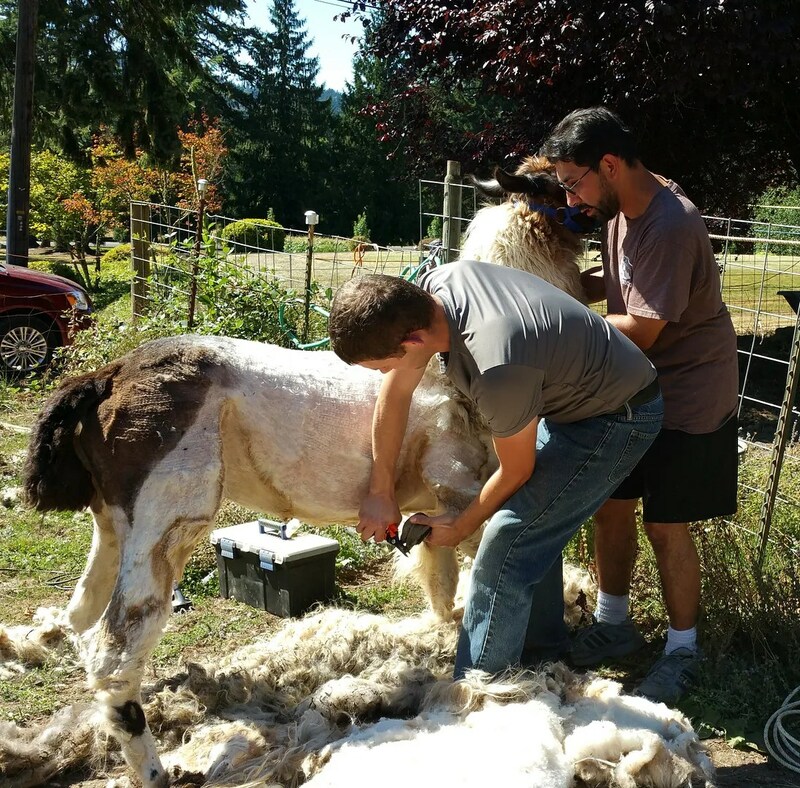 And as you can see, Rayado would not put up with having his front leg fleece sheared. He was the boss on that. He did need a bit more persuasion, however. I’m sure he remembered before, when his eye first got infected, and he was cooped up in the barn for two months while he got treated. In you go, big boy! Whew. 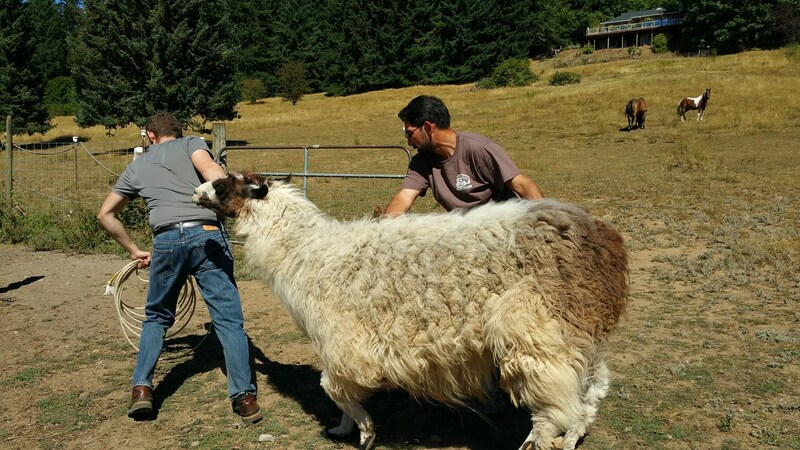 One llama down, one sheep to go. That’ll be up next! 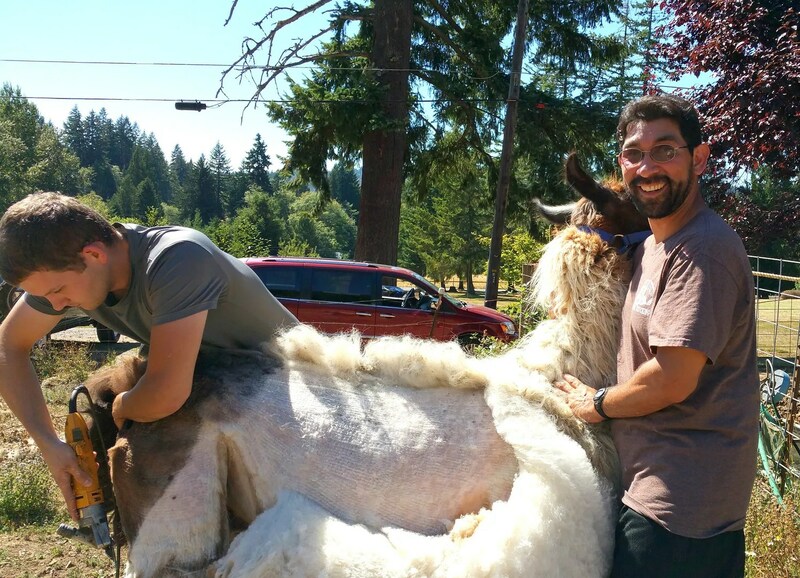 This entry was posted in Da Kine: Sometimes Full-on Pidgin, Farm Stuffs and tagged llama, rayado, shearing. Bookmark the permalink. Oh my gosh… he is SO lonely! But the thing is that we’re downsizing in a year…and then we’d have to find a new home for him. I wish I could!! As someone who proofreads as part of her job, I *love* the whole indefinitely pronoun/pronoun antecedent issue! But I’m a geek–that’s not news. Thanks for sharing this fascinating, and little-known-to-city-slickers part of farm life. Soooo interesting. No wonder we’re friends, my geeky sister. (Some would call me the grammar police.) I was brought up that good spelling/grammar usage is really important…but it doesn’t seem to matter much these days. Even some books I’ve read need more editing, in my opinion. And don’t even get me started on books about or taking place in Hawaiʻi, where some of the diacritical marks are there and some aren’t! I am loving these posts. I am too city and never thought of this kind of stuff when having animals. I always dreamed of retiring in Kula Maui with a few farms animals just for companionship. Of course I can’t afford land in Kula and I wouldn’t begin to know how to care for farm animals so it all ends well. Until my friend got a horse I didn’t realize the amount of care that goes into owning a horse not to mention the $$$ so earth to space connected. A Big Mahalo Nui Loa. Oh, I’m so happy you’re enjoying them! 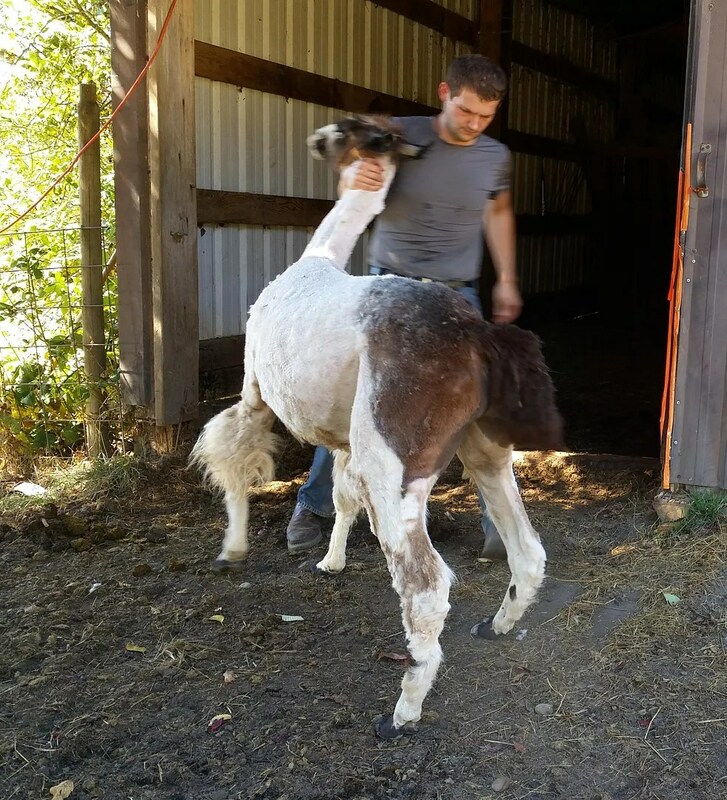 I love writing them and sharing what it’s like having farm animals. I would love to have land in Kula, too, but no way. 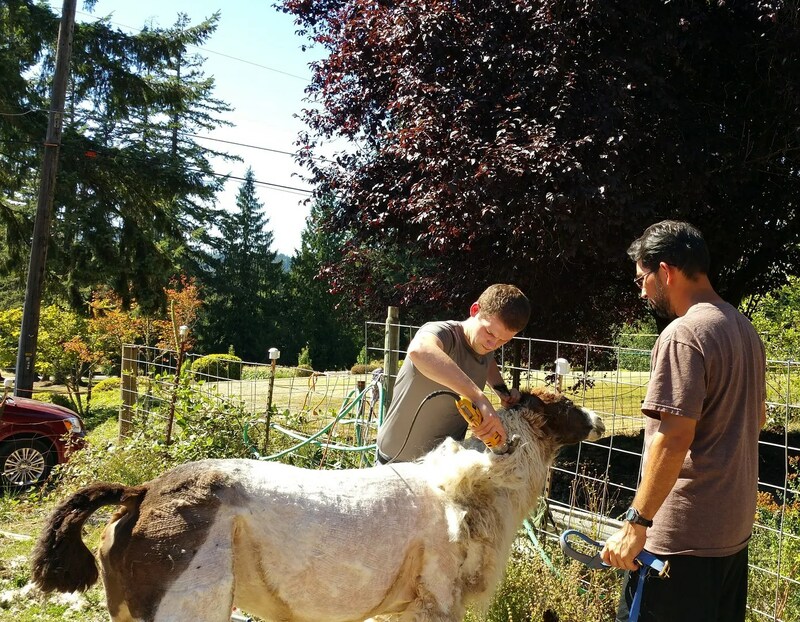 Yeah, it takes plenny kala to take care of our farm animals…to treat Rayado’s eye, give him and Titus yearly shots, cost over $300.00. Ack! !